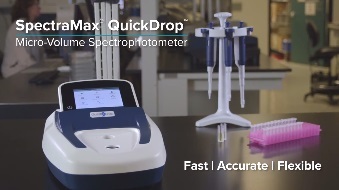 The SpectraMax® QuickDrop™ Micro-Volume Spectrophotometer addresses the needs of life science researchers who quantify very small amounts of DNA, RNA,Oligos and proteins. The stand-alone unit with a small footprint has a built-in sample port that allows to work with volumes as small as 0.5µL and comes with a cuvette port that helps measurements with large volume samples. Wide detection range (1 ng/ µL to 2500 ng/ µL) and low sample carryover make the QuickDrop a versatile instrument for accurate quantitative analysis in life research. The built-in LCD touchscreen provides researchers important information such as sample concentration and purity. Using the ‘Wavescan’ function, contaminants can be identified in samples due to the increase in absorbances at 230nm as compared to a control, during nucleic acid quantitation. This function is useful in DNA purification processes where contaminants such as guanidine thiocyanate are encountered. The QuickDrop Spectrophotometer is maintenance-free and requires no calibration. One-swipe cleaning streamlines workflow and allows easy sample switch-over. The large high-resolution touch-screen interface offers the ability to take advantage of pre-configured analysis methods, set up customized experiment with ease and allows export of data to a USB flash drive for additional analysis. 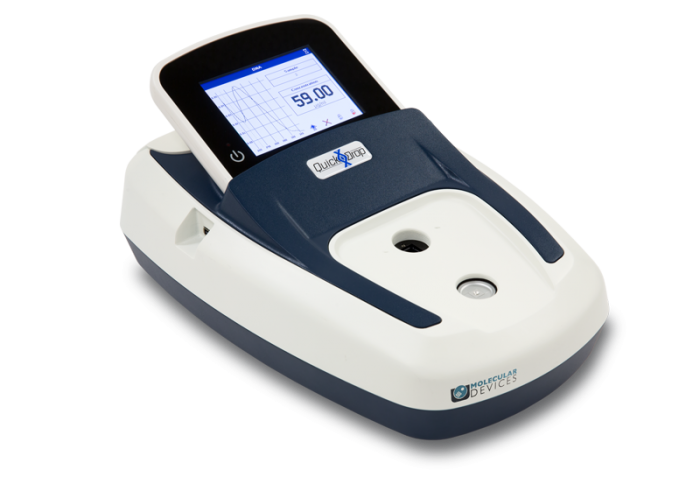 The QuickDrop provides significant advantages over the other models in the market- ability to measure 0.5µL volumes with the horizontal micro-volume sample port that has no moving parts, easily measure viscous samples or samples containing detergent, fixed path lengths needing no calibration etc.